It's another tiny detail that is all-important in marketing urban cycling for the masses as opposed to the minority. When the transformation of the now famous street Nørrebrogade [North Bridge Street] was being planned and implemented, I noticed a detail in the terminology used by the City of Copenhagen's Bicycle Office. Nørrebrogade is not only the busiest bicyle street in the western world, it has also, over the past year or so, been a traffic planning showcase for how to recreate liveable neighbourhoods and prioritize bicycles, pedestrians and busses over cars. It was here the Green Wave for cyclists was implemented, regulating the traffic signals for bicycles so that if you cycle at 20 km/h you'll never put a foot down all the way into the city centre and home again. It was also here that cars were shunted away so that the neighbourhood would blossom once again. In places there are now bicycle lanes that are double as wide, after another lane was reclaimed from motorised traffic. Simply to accomodate the 38,000 cyclists that use the stretch each day. The width of the lanes is now over 5 metres wide. Here's the detail. At the beginning the new 'outside lane' - visible to the right of the two Copenhageners in the photo - was referred to as a 'fast lane'. When the lanes were completed there was no reference to the outside lane. Instead, the pre-existing inside lane was now called the "Conversation Lane". Illustrated brilliantly by the two Copenhageners, above. Why sell speed when the vast majority of people on bicycles are content to take it easy on their way to work or the cinema or a café? Selling speed isn't exactly good for traffic safety. Nor does catering to the minority who like to go faster benefit the majority who don't. The quicker cyclists now have a space all their own and the Conversation Lane is for the rest of us. 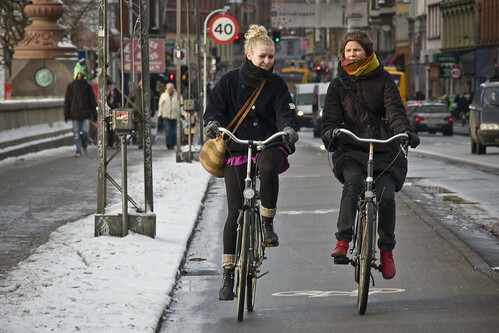 It encourages the social aspect of urban cycling. A little marketing/terminology detail that speaks volumes about the ongoing promotion of cycling in Copenhagen. And even though the City has an annual bicycle budget of 75 million kroner [$15 million dollars] to maintain the existing infrastructure and build new, it's these very human, anthropological details that make so much difference.